This PDQ summary addresses the staging and treatment of ovarian epithelial cancer, fallopian tube cancer (FTC), and primary peritoneal cancer (PPC). 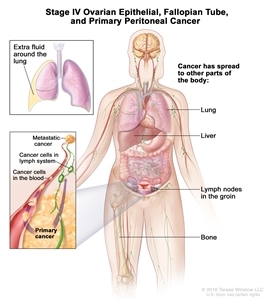 Regardless of the site of origin, the hallmark of these cancers is their early peritoneal spread of metastases. The inclusion of FTC and PPC within the ovarian epithelial cancer designation is generally accepted on the basis of much evidence that points to a common Müllerian epithelium derivation and similar management of these three neoplasms. The hypothesis that many high-grade serous ovarian cancers (the most common histologic subtype) may arise from precursor lesions that originate in the fimbriae of the fallopian tubes has been supported by findings from risk-reducing surgeries in healthy women with BRCA1 or BRCA2 mutations. In addition, histologically similar cancers diagnosed as primary peritoneal carcinomas share molecular findings, such as loss or inactivation of the tumor-suppressor p53 and BRCA1 or BRCA2 proteins. Therefore, high-grade serous adenocarcinomas arising from the fallopian tube and elsewhere in the peritoneal cavity, together with most ovarian epithelial cancers, represent extrauterine adenocarcinomas of Müllerian epithelial origin and are staged and treated similarly to ovarian cancer. Since 2000, FTC and PPC have usually been included in ovarian cancer clinical trials. Clear cell and endometrioid ovarian cancers that are linked to endometriosis have different gene-expression signatures, as do mucinous subtypes. Epithelial carcinoma of the ovary is one of the most common gynecologic malignancies, with 50% of all cases occurring in women older than 65 years. It is the fifth most frequent cause of cancer death in women. The fimbriated ends of the fallopian tubes are in close apposition to the ovaries and in the peritoneal space, as opposed to the corpus uteri (body of the uterus) that is located under a layer of peritoneum. 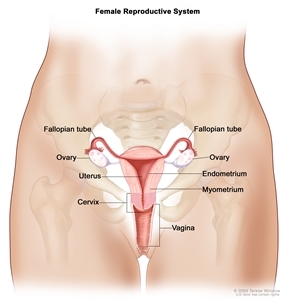 Normal female reproductive system anatomy. The most important risk factor for ovarian cancer is a history of ovarian cancer in a first-degree relative (mother, daughter, or sister). Approximately 20% of ovarian cancers are familial, and although most of these are linked to mutations in either the BRCA1 or BRCA2 gene, several other genes have been implicated. [6,7] The risk is highest in women who have two or more first-degree relatives with ovarian cancer. The risk is somewhat less for women who have one first-degree relative and one second-degree relative (grandmother or aunt) with ovarian cancer. In most families affected with breast and ovarian cancer syndrome or site-specific ovarian cancer, genetic linkage to the BRCA1 locus on chromosome 17q21 has been identified. [9,10,11]BRCA2, also responsible for some instances of inherited ovarian and breast cancer, has been mapped by genetic linkage to chromosome 13q12. The lifetime risk for developing ovarian cancer in patients harboring germline mutations in BRCA1 is substantially increased over that of the general population. [13,14] Two retrospective studies of patients with germline mutations in BRCA1 suggest that the women in these studies have improved survival compared with BRCA1 mutation-negative women. [15,16][Level of evidence: 3iiiA] Most women with a BRCA1 mutation probably have family members with a history of ovarian and/or breast cancer; therefore, the women in these studies may have been more vigilant and inclined to participate in cancer screening programs that may have led to earlier detection. Pain, swelling, or a feeling of pressure in the abdomen or pelvis. Vaginal bleeding that is heavy or irregular, especially after menopause. Vaginal discharge that is clear, white, or colored with blood. A lump in the pelvic area. Gastrointestinal problems such as gas, bloating, or constipation. Screening procedures such as gynecologic assessment, vaginal ultrasound, and cancer antigen 125 (CA-125) assay have had low predictive value in detecting ovarian cancer in women without special risk factors. [25,26] As a result of these confounding factors, annual mortality in ovarian cancer is approximately 65% of the incidence rate. Most patients with ovarian cancer have widespread disease at presentation. Early peritoneal spread of the most common subtype of high-grade serous cancers may relate to serous cancers starting in the fimbriae of the fallopian tubes or in the peritoneum, readily explaining why such cancers are detected at an advanced stage. 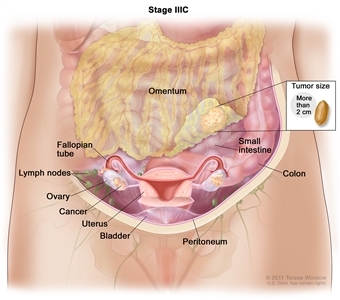 Conversely, high-grade serous cancers are underrepresented among stage I cancers of the ovary. Other types of ovarian cancers are, in fact, overrepresented in cancers detected in stages I and II. This type of ovarian cancer usually spreads via local shedding into the peritoneal cavity followed by implantation on the peritoneum and via local invasion of bowel and bladder. The incidence of positive nodes at primary surgery has been reported to be as high as 24% in patients with stage I disease, 50% in patients with stage II disease, 74% in patients with stage III disease, and 73% in patients with stage IV disease. The pelvic nodes were involved as often as the para-aortic nodes. Tumor cells may also block diaphragmatic lymphatics. The resulting impairment of lymphatic drainage of the peritoneum is thought to play a role in development of ascites in ovarian cancer. Transdiaphragmatic spread to the pleura is common. Ultrasound exam (pelvic or transvaginal). Cell type other than mucinous or clear cell. Lower disease volume before surgical debulking. Smaller residual tumor after primary cytoreductive surgery. BRCA1 or BRCA2 mutation carrier. For patients with stage I disease, the most important prognostic factor associated with relapse is grade, followed by dense adherence and large-volume ascites. 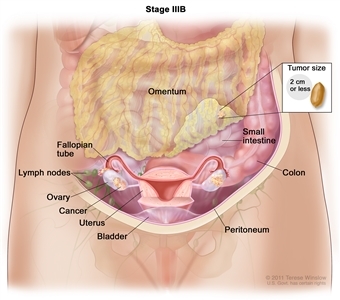 Stage I tumors have a high proportion of low-grade serous cancers. These cancers have a derivation distinctly different from that of high-grade serous cancers, which usually present in stages III and IV. Many high-grade serous cancers originate in the fallopian tube and other areas of extrauterine Müllerian epithelial origin. The use of DNA flow cytometric analysis of tumors from stage I and stage IIA patients may identify a group of high-risk patients. Patients with clear cell histology appear to have a worse prognosis. Patients with a significant component of transitional cell carcinoma appear to have a better prognosis. Levanon K, Crum C, Drapkin R: New insights into the pathogenesis of serous ovarian cancer and its clinical impact. J Clin Oncol 26 (32): 5284-93, 2008. Birrer MJ: The origin of ovarian cancer-is it getting clearer? N Engl J Med 363 (16): 1574-5, 2010. Dubeau L, Drapkin R: Coming into focus: the nonovarian origins of ovarian cancer. Ann Oncol 24 (Suppl 8): viii28-viii35, 2013. Yancik R: Ovarian cancer. Age contrasts in incidence, histology, disease stage at diagnosis, and mortality. Cancer 71 (2 Suppl): 517-23, 1993. Lynch HT, Watson P, Lynch JF, et al. : Hereditary ovarian cancer. Heterogeneity in age at onset. Cancer 71 (2 Suppl): 573-81, 1993. Pennington KP, Swisher EM: Hereditary ovarian cancer: beyond the usual suspects. Gynecol Oncol 124 (2): 347-53, 2012. Piver MS, Goldberg JM, Tsukada Y, et al. : Characteristics of familial ovarian cancer: a report of the first 1,000 families in the Gilda Radner Familial Ovarian Cancer Registry. Eur J Gynaecol Oncol 17 (3): 169-76, 1996. Miki Y, Swensen J, Shattuck-Eidens D, et al. : A strong candidate for the breast and ovarian cancer susceptibility gene BRCA1. Science 266 (5182): 66-71, 1994. Easton DF, Bishop DT, Ford D, et al. : Genetic linkage analysis in familial breast and ovarian cancer: results from 214 families. The Breast Cancer Linkage Consortium. Am J Hum Genet 52 (4): 678-701, 1993. Steichen-Gersdorf E, Gallion HH, Ford D, et al. : Familial site-specific ovarian cancer is linked to BRCA1 on 17q12-21. Am J Hum Genet 55 (5): 870-5, 1994. Wooster R, Neuhausen SL, Mangion J, et al. : Localization of a breast cancer susceptibility gene, BRCA2, to chromosome 13q12-13. Science 265 (5181): 2088-90, 1994. Easton DF, Ford D, Bishop DT: Breast and ovarian cancer incidence in BRCA1-mutation carriers. Breast Cancer Linkage Consortium. Am J Hum Genet 56 (1): 265-71, 1995. Struewing JP, Hartge P, Wacholder S, et al. : The risk of cancer associated with specific mutations of BRCA1 and BRCA2 among Ashkenazi Jews. N Engl J Med 336 (20): 1401-8, 1997. Rubin SC, Benjamin I, Behbakht K, et al. : Clinical and pathological features of ovarian cancer in women with germ-line mutations of BRCA1. N Engl J Med 335 (19): 1413-6, 1996. Aida H, Takakuwa K, Nagata H, et al. : Clinical features of ovarian cancer in Japanese women with germ-line mutations of BRCA1. Clin Cancer Res 4 (1): 235-40, 1998. Rebbeck TR, Lynch HT, Neuhausen SL, et al. : Prophylactic oophorectomy in carriers of BRCA1 or BRCA2 mutations. N Engl J Med 346 (21): 1616-22, 2002. Klaren HM, van't Veer LJ, van Leeuwen FE, et al. : Potential for bias in studies on efficacy of prophylactic surgery for BRCA1 and BRCA2 mutation. J Natl Cancer Inst 95 (13): 941-7, 2003. Piver MS, Jishi MF, Tsukada Y, et al. : Primary peritoneal carcinoma after prophylactic oophorectomy in women with a family history of ovarian cancer. A report of the Gilda Radner Familial Ovarian Cancer Registry. Cancer 71 (9): 2751-5, 1993. Goff BA, Mandel L, Muntz HG, et al. : Ovarian carcinoma diagnosis. Cancer 89 (10): 2068-75, 2000. Friedman GD, Skilling JS, Udaltsova NV, et al. : Early symptoms of ovarian cancer: a case-control study without recall bias. Fam Pract 22 (5): 548-53, 2005. Smith LH, Morris CR, Yasmeen S, et al. : Ovarian cancer: can we make the clinical diagnosis earlier? Cancer 104 (7): 1398-407, 2005. Goff BA, Mandel LS, Melancon CH, et al. : Frequency of symptoms of ovarian cancer in women presenting to primary care clinics. JAMA 291 (22): 2705-12, 2004. Goff BA, Mandel LS, Drescher CW, et al. : Development of an ovarian cancer symptom index: possibilities for earlier detection. Cancer 109 (2): 221-7, 2007. Partridge E, Kreimer AR, Greenlee RT, et al. : Results from four rounds of ovarian cancer screening in a randomized trial. Obstet Gynecol 113 (4): 775-82, 2009.
van Nagell JR Jr, Miller RW, DeSimone CP, et al. : Long-term survival of women with epithelial ovarian cancer detected by ultrasonographic screening. Obstet Gynecol 118 (6): 1212-21, 2011. Burghardt E, Girardi F, Lahousen M, et al. : Patterns of pelvic and paraaortic lymph node involvement in ovarian cancer. Gynecol Oncol 40 (2): 103-6, 1991. Berek JS, Knapp RC, Malkasian GD, et al. : CA 125 serum levels correlated with second-look operations among ovarian cancer patients. Obstet Gynecol 67 (5): 685-9, 1986. Atack DB, Nisker JA, Allen HH, et al. : CA 125 surveillance and second-look laparotomy in ovarian carcinoma. Am J Obstet Gynecol 154 (2): 287-9, 1986. Omura GA, Brady MF, Homesley HD, et al. : Long-term follow-up and prognostic factor analysis in advanced ovarian carcinoma: the Gynecologic Oncology Group experience. J Clin Oncol 9 (7): 1138-50, 1991.
van Houwelingen JC, ten Bokkel Huinink WW, van der Burg ME, et al. : Predictability of the survival of patients with advanced ovarian cancer. J Clin Oncol 7 (6): 769-73, 1989. Neijt JP, ten Bokkel Huinink WW, van der Burg ME, et al. : Long-term survival in ovarian cancer. Mature data from The Netherlands Joint Study Group for Ovarian Cancer. Eur J Cancer 27 (11): 1367-72, 1991. Hoskins WJ, Bundy BN, Thigpen JT, et al. : The influence of cytoreductive surgery on recurrence-free interval and survival in small-volume stage III epithelial ovarian cancer: a Gynecologic Oncology Group study. Gynecol Oncol 47 (2): 159-66, 1992. Thigpen T, Brady MF, Omura GA, et al. : Age as a prognostic factor in ovarian carcinoma. The Gynecologic Oncology Group experience. Cancer 71 (2 Suppl): 606-14, 1993. Dembo AJ, Davy M, Stenwig AE, et al. : Prognostic factors in patients with stage I epithelial ovarian cancer. Obstet Gynecol 75 (2): 263-73, 1990. Ahmed FY, Wiltshaw E, A'Hern RP, et al. : Natural history and prognosis of untreated stage I epithelial ovarian carcinoma. J Clin Oncol 14 (11): 2968-75, 1996. Monga M, Carmichael JA, Shelley WE, et al. : Surgery without adjuvant chemotherapy for early epithelial ovarian carcinoma after comprehensive surgical staging. Gynecol Oncol 43 (3): 195-7, 1991. Kolomainen DF, A'Hern R, Coxon FY, et al. : Can patients with relapsed, previously untreated, stage I epithelial ovarian cancer be successfully treated with salvage therapy? J Clin Oncol 21 (16): 3113-8, 2003. Schueler JA, Cornelisse CJ, Hermans J, et al. : Prognostic factors in well-differentiated early-stage epithelial ovarian cancer. Cancer 71 (3): 787-95, 1993. Young RC, Walton LA, Ellenberg SS, et al. : Adjuvant therapy in stage I and stage II epithelial ovarian cancer. Results of two prospective randomized trials. N Engl J Med 322 (15): 1021-7, 1990. Gershenson DM, Silva EG, Mitchell MF, et al. : Transitional cell carcinoma of the ovary: a matched control study of advanced-stage patients treated with cisplatin-based chemotherapy. Am J Obstet Gynecol 168 (4): 1178-85; discussion 1185-7, 1993. Vencken PM, Kriege M, Hoogwerf D, et al. : Chemosensitivity and outcome of BRCA1- and BRCA2-associated ovarian cancer patients after first-line chemotherapy compared with sporadic ovarian cancer patients. Ann Oncol 22 (6): 1346-52, 2011. Safra T, Borgato L, Nicoletto MO, et al. : BRCA mutation status and determinant of outcome in women with recurrent epithelial ovarian cancer treated with pegylated liposomal doxorubicin. Mol Cancer Ther 10 (10): 2000-7, 2011. Rustin GJ, van der Burg ME, Griffin CL, et al. : Early versus delayed treatment of relapsed ovarian cancer (MRC OV05/EORTC 55955): a randomised trial. Lancet 376 (9747): 1155-63, 2010. Table 1 describes the histologic classification of ovarian epithelial cancer, fallopian tube cancer (FTC), and primary peritoneal cancer (PPC). FTC = fallopian tube cancer; PPC = primary peritoneal cancer. Serous cystomas Serous benign cystadenomas. Serous cystadenomas with proliferating activity of the epithelial cells and nuclear abnormalities but with no infiltrative destructive growth (refer to the PDQ summary on Ovarian Low Malignant Potential Tumors Treatmentfor more information). Mucinous cystomas Mucinous benign cystadenomas. Mucinous cystadenomas with proliferating activity of the epithelial cells and nuclear abnormalities but with no infiltrative destructive growth (low malignant potential or borderline malignancy). Endometrioid tumors (similar to adenocarcinomas in the endometrium) Endometrioid benign cysts. Endometrioid tumors with proliferating activity of the epithelial cells and nuclear abnormalities but with no infiltrative destructive growth (low malignant potential or borderline malignancy). Clear cell (mesonephroid) tumors Benign clear cell tumors. Clear cell tumors with proliferating activity of the epithelial cells and nuclear abnormalities but with no infiltrative destructive growth (low malignant potential or borderline malignancy). a Adapted from the Féderation Internationale de Gynécologie et d'Obstétrique. I Tumor confined to ovaries or fallopian tube(s). 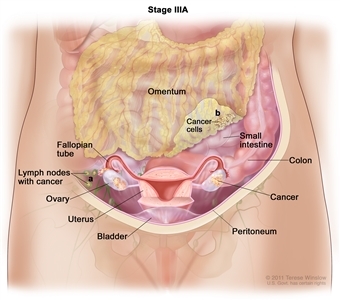 IA Tumor limited to one ovary (capsule intact) or fallopian tube; no tumor on ovarian or fallopian tube surface; no malignant cells in the ascites or peritoneal washings. IB Tumor limited to both ovaries (capsules intact) or fallopian tubes; no tumor on ovarian or fallopian tube surface; no malignant cells in the ascites or peritoneal washings. IC2: Capsule ruptured before surgery or tumor on ovarian or fallopian tube surface. IC3: Malignant cells present in the ascites or peritoneal washings. II Tumor involves one or both ovaries or fallopian tubes with pelvic extension (below pelvic brim) or peritoneal cancer (Tp). IIA Extension and/or implants on the uterus and/or fallopian tubes and/or ovaries. IIB Extension to other pelvic intraperitoneal tissues. b Includes extension of tumor to capsule of liver and spleen without parenchymal involvement of either organ. III Tumor involves one or both ovaries, or fallopian tubes, or primary peritoneal cancer, with cytologically or histologically confirmed spread to the peritoneum outside of the pelvis and/or metastasis to the retroperitoneal lymph nodes. IIIA Metastasis to the retroperitoneal lymph nodes with or without microscopic peritoneal involvement beyond the pelvis. IIIA(i) Positive retroperitoneal lymph nodes only (cytologically or histologically proven). IIIA(ii) Metastasis >10 mm in greatest dimension. IIIA2 Microscopic extrapelvic (above the pelvic brim) peritoneal involvement with or without positive retroperitoneal lymph nodes. IIIB Macroscopic peritoneal metastases beyond the pelvic brim ≤2 cm in greatest dimension, with or without metastasis to the retroperitoneal lymph nodes. b Parenchymal metastases are stage IVB. IV Distant metastasis excluding peritoneal metastases. IVA Pleural effusion with positive cytology. Hoskins WJ: Surgical staging and cytoreductive surgery of epithelial ovarian cancer. Cancer 71 (4 Suppl): 1534-40, 1993. Mutch DG, Prat J: 2014 FIGO staging for ovarian, fallopian tube and peritoneal cancer. Gynecol Oncol 133 (3): 401-4, 2014. Treatment options for patients with all stages of ovarian epithelial cancer, fallopian tube cancer (FTC), and primary peritoneal cancer (PPC) have consisted of surgery followed by platinum-based chemotherapy. Early stage refers to stages I and II. However, because of high recurrence rates for stage II patients in early-stage disease trials, patients with stage II cancers have been included with patients who have more advanced-stage cancer in Gynecologic Oncology Group clinical trials since 2009. Going forward, stage I will remain a separate category for treatment considerations, but high-grade serous stage II cancers are likely to be included with more advanced stages. Numerous clinical trials are in progress to refine existing therapies and test the value of different approaches to postoperative drug and radiation therapy. Patients with any stage of ovarian cancer are appropriate candidates for clinical trials. [1,2] Information about ongoing clinical trials is available from the NCI website. The treatment options for ovarian epithelial cancer, FTC, and PPC are presented in Table 6. OS = overall survival; PARP = poly (ADP) ribose-polymerase. Ozols RF, Young RC: Ovarian cancer. Curr Probl Cancer 11 (2): 57-122, 1987 Mar-Apr. Cannistra SA: Cancer of the ovary. N Engl J Med 329 (21): 1550-9, 1993. Early stage refers to stage I and stage II. However, because of high recurrence rates for stage II patients in early-stage disease trials, patients with stage II cancers have been included with patients who have more advanced-stage cancer in Gynecologic Oncology Group (GOG) clinical trials since 2009. Going forward, stage I will remain a separate category for treatment considerations, but high-grade serous stage II cancers are likely to be included with more advanced stages. Surgery with or without chemotherapy. If the tumor is well differentiated or moderately well differentiated, surgery alone may be adequate treatment for patients with stage IA or IB disease. Surgery includes hysterectomy, bilateral salpingo-oophorectomy, and omentectomy. The undersurface of the diaphragm is visualized and biopsied. Biopsies of the pelvic and abdominal peritoneum and the pelvic and para-aortic lymph nodes are also performed. Peritoneal washings are routinely obtained. [1,2] In patients who desire childbearing and have grade I tumors, unilateral salpingo-oophorectomy may be associated with a low risk of recurrence. In the United States, except for the most favorable subset of patients (those with stage IA well-differentiated disease), evidence based on double-blinded, randomized, controlled trials with total mortality endpoints supports adjuvant treatment with cisplatin, carboplatin, and paclitaxel. The EORTC-ACTION trial required at least four cycles of carboplatin or cisplatin-based chemotherapy as treatment. Although surgical staging criteria were monitored, inadequate staging was not an exclusion criterion. Recurrence-free survival (RFS) was improved in the adjuvant chemotherapy arm (hazard ratio [HR], 0.63; P = .02), but overall survival (OS) was not affected (HR, 0.69; 95% confidence interval [CI], 0.44-1.08; P = .10). OS was improved by chemotherapy in the subset of patients with inadequate surgical staging. The MRC-ICON1 trial randomly assigned patients to six cycles of single-agent carboplatin or cisplatin or platinum-based chemotherapy (usually cyclophosphamide, doxorubicin, and cisplatin) versus observation and had entry criteria similar to the EORTC-ACTION trial; however, the MRC-ICON1 trial did not monitor whether adequate surgical staging was performed. When the results of the trials were combined, the difference in OS achieved statistical significance. Both RFS and OS were significantly improved; 5-year survival figures were 79% with adjuvant chemotherapy versus 70% without adjuvant chemotherapy. An accompanying editorial emphasized that the focus of subsequent trials must be to identify patients who do not require additional therapy among the early ovarian cancer subset. Optimal staging is one way to better identify these patients. As expected, the use of six cycles was associated with increased grade 3 or 4 neurologic toxic effects and increased grade 4 hematologic toxic effects. Although surgical staging was required for study entry, an audit revealed that 29% of the patients had either incomplete documentation of their surgery or insufficient surgical effort. In a post-hoc analysis of the patients who underwent complete surgical staging, three additional cycles of chemotherapy decreased the risk of recurrence by only 3%. The cumulative incidence of recurrence within 5 years was 18% for women with stage I disease and 33% for women with stage II disease. Given the increased risk of recurrence in patients with stage II disease and combined with an earlier trial, the Ovarian Committee of the GOG has opted to include patients with stage II disease in advanced ovarian cancer trials. The interpretation of this study, including findings on subset analyses, has been a source of controversy. Platinum-based systemic chemotherapy with paclitaxel. Check the list of NCI-supported cancer clinical trials that are now accepting patients with stage I ovarian epithelial cancer, primary peritoneal cavity cancer, fallopian tube cancer and primary peritoneal cavity cancer. The list of clinical trials can be further narrowed by location, drug, intervention, and other criteria. Young RC, Decker DG, Wharton JT, et al. : Staging laparotomy in early ovarian cancer. JAMA 250 (22): 3072-6, 1983. Fader AN, Java J, Ueda S, et al. : Survival in women with grade 1 serous ovarian carcinoma. Obstet Gynecol 122 (2 Pt 1): 225-32, 2013. Zanetta G, Chiari S, Rota S, et al. : Conservative surgery for stage I ovarian carcinoma in women of childbearing age. Br J Obstet Gynaecol 104 (9): 1030-5, 1997. Trimbos JB, Vergote I, Bolis G, et al. : Impact of adjuvant chemotherapy and surgical staging in early-stage ovarian carcinoma: European Organisation for Research and Treatment of Cancer-Adjuvant ChemoTherapy in Ovarian Neoplasm trial. J Natl Cancer Inst 95 (2): 113-25, 2003. Colombo N, Guthrie D, Chiari S, et al. : International Collaborative Ovarian Neoplasm trial 1: a randomized trial of adjuvant chemotherapy in women with early-stage ovarian cancer. J Natl Cancer Inst 95 (2): 125-32, 2003. Trimbos JB, Parmar M, Vergote I, et al. : International Collaborative Ovarian Neoplasm trial 1 and Adjuvant ChemoTherapy In Ovarian Neoplasm trial: two parallel randomized phase III trials of adjuvant chemotherapy in patients with early-stage ovarian carcinoma. J Natl Cancer Inst 95 (2): 105-12, 2003. Young RC: Early-stage ovarian cancer: to treat or not to treat. J Natl Cancer Inst 95 (2): 94-5, 2003. Bell J, Brady MF, Young RC, et al. : Randomized phase III trial of three versus six cycles of adjuvant carboplatin and paclitaxel in early stage epithelial ovarian carcinoma: a Gynecologic Oncology Group study. Gynecol Oncol 102 (3): 432-9, 2006. Katsumata N, Yasuda M, Takahashi F, et al. : Dose-dense paclitaxel once a week in combination with carboplatin every 3 weeks for advanced ovarian cancer: a phase 3, open-label, randomised controlled trial. Lancet 374 (9698): 1331-8, 2009. Katsumata N, Yasuda M, Isonishi S, et al. : Long-term results of dose-dense paclitaxel and carboplatin versus conventional paclitaxel and carboplatin for treatment of advanced epithelial ovarian, fallopian tube, or primary peritoneal cancer (JGOG 3016): a randomised, controlled, open-label trial. Lancet Oncol 14 (10): 1020-6, 2013. Scambia G, Salutari V, Amadio G: Controversy in treatment of advanced ovarian cancer. Lancet Oncol 14 (10): 920-1, 2013. Vergote IB, Vergote-De Vos LN, Abeler VM, et al. : Randomized trial comparing cisplatin with radioactive phosphorus or whole-abdomen irradiation as adjuvant treatment of ovarian cancer. Cancer 69 (3): 741-9, 1992. Piver MS, Lele SB, Bakshi S, et al. : Five and ten year estimated survival and disease-free rates after intraperitoneal chromic phosphate; stage I ovarian adenocarcinoma. Am J Clin Oncol 11 (5): 515-9, 1988. Bolis G, Colombo N, Pecorelli S, et al. : Adjuvant treatment for early epithelial ovarian cancer: results of two randomised clinical trials comparing cisplatin to no further treatment or chromic phosphate (32P). G.I.C.O.G. : Gruppo Interregionale Collaborativo in Ginecologia Oncologica. Ann Oncol 6 (9): 887-93, 1995. Piver MS, Malfetano J, Baker TR, et al. : Five-year survival for stage IC or stage I grade 3 epithelial ovarian cancer treated with cisplatin-based chemotherapy. Gynecol Oncol 46 (3): 357-60, 1992. McGuire WP: Early ovarian cancer: treat now, later or never? Ann Oncol 6 (9): 865-6, 1995. Treatment options for patients with all stages of ovarian epithelial cancer, fallopian tube cancer (FTC), and primary peritoneal cancer (PPC) have consisted of surgery followed by platinum-based chemotherapy. Because of high recurrence rates for stage II patients in early-stage disease trials, patients with stage II cancers have been included with patients who have more advanced-stage cancer in Gynecologic Oncology Group (GOG) clinical trials since 2009. Going forward, stage I will remain a separate category for treatment considerations, but high-grade serous stage II cancers are likely to be included with more advanced stages. Surgery followed by systemic chemotherapy. Surgery followed by intraperitoneal (IP) chemotherapy. Surgery followed by chemotherapy and bevacizumab. Surgery followed by chemotherapy and poly (ADP-ribose) polymerase (PARP) inhibitors. Chemotherapy for patients who cannot have surgery (although the impact on OS has not been proven). Patients diagnosed with advanced disease are treated with surgery and chemotherapy; however, the outcome is generally less favorable for patients with stage IV disease. The role of surgery for patients with stage IV disease is unclear, but in most instances, the bulk of the disease is intra-abdominal, and surgical procedures similar to those used in the management of patients with stage III disease are applied. The options for IP regimens are also less likely to apply both practically (as far as inserting an IP catheter at the outset) and theoretically (aimed at destroying microscopic disease in the peritoneal cavity) in patients with stage IV disease. Surgery is used to adequately stage the disease and as a therapeutic modality. Surgery includes total abdominal hysterectomy and bilateral salpingo-oophorectomy with omentectomy and debulking of as much gross tumor as can safely be performed. Results of a retrospective analysis of 349 patients with postoperative residual masses no larger than 1 cm suggested that patients who present at the outset with large-volume disease and achieve small-volume disease by surgical debulking have poorer outcomes than similar patients who present with small-volume disease. Gradual improvement in survival with decreasing residual tumor volume is likely. Although the association may not be causal, retrospective analyses, including a meta-analysis of patients receiving platinum-based chemotherapy, have also found cytoreduction to be an independent prognostic variable for survival. [3,4] An analysis of 2,655 patients enrolled in GOG-0182 (NCT00011986) found that only cytoreduction to node-visible disease that is R0 (i.e., complete surgical resection) had an independent effect on survival. For the past three decades, the GOG has conducted separate trials for women whose disease has been optimally cytoreduced (defined as ≤1 cm residuum) and for those who had suboptimal cytoreductions (>1 cm residuum). The extent of residual disease after the initial surgery is a determinant of outcome in most series [1,2,3,4] and has been used in the design of clinical trials, particularly by the GOG. For patients with residual disease larger than 1 cm after surgery, systemic chemotherapy is the standard. Platinum agents, such as cisplatin or its second-generation analog, carboplatin, given either alone or in combination with other drugs, are the foundation of chemotherapy regimens used. Trials by various cooperative groups (1999-2010) addressed issues of optimal dose-intensity [8,9,10] for both cisplatin and carboplatin, schedule, and the equivalent results obtained with either of these platinum drugs, usually in combination with cyclophosphamide. With the introduction of the taxane paclitaxel, two trials confirmed the superiority of cisplatin combined with paclitaxel when compared with the previous standard treatment of cisplatin plus cyclophosphamide. [14,15] However, two trials that compared single-agent paclitaxel with either cisplatin or carboplatin (ICON2 and GOG-132) failed to confirm such superiority in all outcome parameters (i.e., response, time-to-progression, and survival) (see Table 7 for a list of these studies). Based on the evidence, the initial standard treatment for patients with ovarian cancer is the combination of cisplatin or carboplatin with paclitaxel (defined as induction chemotherapy). GOG-132 was widely regarded as showing that sequential treatment with cisplatin and paclitaxel was equivalent to the combination of cisplatin- or carboplatin-plus-paclitaxel; however, many patients crossed over before disease progression. Moreover, the cisplatin-only arm was more toxic because it utilized a 100 mg/m2 dose. The Medical Research Council study (MRC-ICON3), while having fewer early crossovers, could be interpreted similarly in regard to the impact of sequential treatment on survival. Noninferiority of carboplatin plus paclitaxel versus carboplatin plus docetaxel. No advantage but increased toxic effects of adding epirubicin to the carboplatin plus paclitaxel doublet. From February 2001 to September 2004, 4,312 women with stage III or stage IV ovarian epithelial cancer, FTC, or PPC participating in the GOG-0182 trial were randomly assigned to four different experimental arms or to a reference treatment consisting of carboplatin (area under the curve [AUC], 6) and paclitaxel (175 mg/m2) every 3 weeks for eight cycles. Stratification factors were residual-disease status and the intention to perform interval debulking surgery. None of the experimental regimens was inferior. Lethal events attributable to treatment occurred in fewer than 1% of patients without clustering to any one regimen. With a median follow-up of 3.7 years, the adjusted relative risk of death ranged from 0.952 to 1.114, with the control arm achieving a progression-free survival (PFS) of 16.0 months and a median overall survival (OS) of 44.1 months. In this large study consisting of two arms of patients with Féderation Internationale de Gynécologie et d'Obstétrique stage III disease (84% in one arm and 87% in the other arm), the extent of cytoreduction was an important prognostic factor in OS, as expected. PFS in patients with residuum larger than 1 cm was 13 months, and OS was 33 months. With residuum 1 cm or smaller, PFS was 16 months, and OS was 40 months. With microscopic residuum, PFS was 29 months, and OS was 68 months. In gynecologic cancer, as opposed to breast cancer, weekly paclitaxel was not explored in phase III trials before 2004. The positive results from Japanese Gynecologic Oncology Group (JGOG) trials have led to a generation of new divided-dose paclitaxel studies. A lower median age (57 years). Twenty percent of patients were stage II. Eleven percent of patients were treated in the neoadjuvant setting. Thirty-three percent of patients had histologies other than high-grade serous or endometrioid cancer. At the 1.5-year follow-up after cessation of treatment, the weekly regimen had a median PFS of 28.0 months (95% confidence interval (CI), 22.3-35.4 months), and the intermittent median PFS was 17.2 months (15.7-21.1; hazard ratio (HR), 0.71), favoring the weekly regimen (P = .0015). The 2013 updated results revealed an increase in median survival for the weekly regimen (median OS, 8.3 years vs. 5.1 years; P = .040); the intermittent regimen results are also noteworthy relative to other clinical trials of weekly dosing schedules. The results failed to confirm the superiority of this particular weekly schedule (18.3 months PFS for the weekly arm vs. 17.3 months PFS for the standard arm [HR, 0.96; 95% CI, 0.80-1.16]). The treatments did not differ in toxic effects. A decrease in quality of life (assessed by the Functional Assessment of Cancer Therapy Ovarian Trial Outcome Index questionnaire) was not seen in the weekly arm compared with the every-3-week arm. AUC = area under the curve; EORTC = European Organization for Research and Treatment of Cancer; GOG = Gynecologic Oncology Group; ICON = International Collaboration on Ovarian Neoplasms; JGOG = Japanese Gynecologic Oncology Group; MITO = Multicentre Italian Trials in Ovarian cancer; MRC = Medical Research Council; No. = number; NR = not reported. a Control arms are bolded. b Statistically inferior result (P < .001-< .05). d Every 3 weeks for six cycles unless specified. e JGOG-3016 included stage II patients. The pharmacologic basis for the delivery of anticancer drugs by the IP route was established in the late 1970s and early 1980s. When several drugs were studied, mostly in the setting of minimal residual disease at reassessment after patients had received their initial chemotherapy, cisplatin alone and in combination received the most attention. Favorable outcomes from IP cisplatin were most often seen when tumors had shown responsiveness to platinum therapy and with small-volume tumors (usually defined as tumors <1 cm). In the 1990s, randomized trials were conducted to evaluate whether the IP route would prove superior to the intravenous (IV) route. IP cisplatin was the common denominator of these randomized trials. Hyperthermic peritoneal chemotherapy (HIPEC) is another pharmacologically-based modality to enhance the antitumor effects via direct drug delivery to peritoneal surfaces. It was initially tested against mucinous tumors of gastrointestinal origin. Increasingly, HIPEC is being applied to ovarian cancers, with considerable variation in patient selection, drugs administered, and time at target temperatures (most often 30 minutes at 42°C). While exploratory trials are ongoing in the setting of recurrent ovarian cancer, such modalities should not be used as a substitute for intraperitoneal cisplatin-based regimens following initial therapy. The role of HIPEC remains experimental in the treatment of patients with high-grade serous ovarian cancers. The use of IP cisplatin as part of the initial approach in patients with stage III optimally debulked ovarian cancer is supported principally by the results of three randomized clinical trials (SWOG-8501, GOG-0114, and GOG-0172 [NCT00003322]). [7,34,35] These studies tested the role of IP drugs (IP cisplatin in all three studies and IP paclitaxel in the last study) against the standard IV regimen. In the three studies, superior PFS and OS favoring the IP arm were documented. Toxic effects were greater in the IP arm because of the cisplatin dose per cycle (100 mg/m2); sensory neuropathy resulted from the additional IP chemotherapy and from the systemic administration of paclitaxel. An updated combined analysis of GOG-0114 and GOG-0172 included 876 patients with a median follow-up of 10.7 years and reported the following results. Median survival with IP therapy was 61.8 months (95% CI, 55.5-69.5) compared with 51.4 months (95% CI, 46.0-58.2) for IV therapy. IP therapy was associated with a 23% decreased risk of death (adjusted hazard ratio [AHR], 0.77; 95% CI, 0.65-0.90; P = .002). IP therapy improved the survival of patients with gross residual (≤1 cm) disease (AHR, 0.75; 95% CI, 0.62-0.92; P = .006). Risk of death decreased by 12% for each cycle of IP chemotherapy completed (AHR, 0.88; 95% CI, 0.83-0.94; P < .001). Factors associated with poorer survival included clear and mucinous versus serous histology (AHR, 2.79; 95% CI, 1.83-4.24; P < .001), gross residual versus no visible disease (AHR, 1.89; 95% CI, 1.48-2.43; P < .001), and fewer versus more cycles of IP chemotherapy (AHR, 0.88; 95% CI, 0.83-0.94; P < .001). Younger patients were more likely to complete the IP regimen, with a 5% decrease in probability of completion with each year of age (odds ratio, 0.95; 95% CI, 0.93-0.96; P < .001). A Cochrane-sponsored meta-analysis of all randomized IP-versus-IV trials showed an HR of 0.79 for disease-free survival and 0.79 for OS, favoring the IP arms. In another meta-analysis of seven randomized trials assessing IP versus systemic chemotherapy conducted by Cancer Care of Ontario, the relative ratio (RR) of disease progression at 5 years based on the three trials that reported this endpoint was 0.91 (95% CI, 0.85-0.98), and the RR of death at 5 years based on six trials was 0.88 (95% CI, 0.81-0.95) for the IP route. Two phase III trials (GOG-0218 [NCT00262847] and ICON7 [NCT00483782]) have evaluated the role of bevacizumab in first-line therapy for ovarian epithelial cancer, FTC, and PPC after surgical cytoreduction. [39,40] Both trials showed a modest improvement in PFS when bevacizumab was added to initial chemotherapy and continued every 3 weeks for 16 and 12 additional cycles, as a maintenance phase. Chemotherapy plus placebo (cycles 2-22) (the control group). Chemotherapy plus bevacizumab (15 mg/kg cycles 2-6), followed by placebo (cycles 7-22) (the bevacizumab-initiation group). Chemotherapy plus bevacizumab (15 mg/kg cycles 2-22) (the bevacizumab-throughout group). There was no difference in PFS between the control group and the bevacizumab-initiation group. There was a statistically significant increase in PFS in the bevacizumab-throughout group when compared with the control group (14.1 months vs. 10.3 months), with an HR of disease progression or death of 0.717 in the bevacizumab-throughout group (95% CI, 0.625-0.824; P < .001). Median OS was 39.3 months for the control group, 38.7 months for the bevacizumab-initiation group, and 39.7 months for the bevacizumab-throughout group. Quality of life was not different between the three groups. Hypertension grade 2 or higher was more common with bevacizumab than with placebo. There were more treatment-related deaths in the bevacizumab-throughout arm (10 of 607, 2.3%) than in the control arm (6 of 601, 1.0%). Median PFS was 17.3 months in the control group and 19 months in the bevacizumab group. HR for disease progression or death in the bevacizumab group was 0.81 (95% CI, 0.70-0.94; P = .004). Grade 3 or higher adverse events were more common in the bevacizumab group, with an increase in bleeding, hypertension (grade 2 or higher), thromboembolic events (grade 3 or higher), and gastrointestinal perforations. Quality of life was not different between the two groups. In 2015, the ICON7 authors reported an updated survival analysis. There was no significant difference with 44.6 months (95% CI 43.2-45.9) in patients on standard chemotherapy versus 45.5 months (44.2-46.7) in patients receiving bevacizumab with the chemotherapy induction, and then completing 1 year of bevacizumab maintenance (log-rank P = 0.85). In summary, the evidence does not support the use of bevacizumab as front-line therapy because the gain in PFS comes with increased toxicity, without improvement in OS or quality of life. PARP is a family of enzymes involved in base-excision repair of DNA single-strand breaks. In patients with homologous recombination deficiency (HRD), including patients with germline BRCA1 or BRCA2 (gBRCA) mutations or with nongermline HRD-positive tumors, inhibition of PARP results in production of double-strand breaks of DNA. Human DNA repair mechanisms largely rely on one intact copy of the gene; cells with a double-strand break are usually targeted for cell death. This susceptibility of BRCA-deficient or BRCA-mutant cells to PARP inhibition,[41,42] has spurred the clinical development of this class of agents. Sensitivity to platinum compounds is a feature of HRD, and a population of platinum-sensitive patients is expected to be HRD-enriched and most likely to benefit from PARP inhibition. OS was not different between the two groups, as noted in an updated report. The more common adverse events in the olaparib group were nausea, fatigue, vomiting, and anemia. In a double blind, placebo-controlled phase III trial, 533 patients with platinum-sensitive, predominantly high-grade serous ovarian cancer were randomly assigned in a 2:1 ratio to maintenance with oral niraparib or placebo and followed for the primary endpoint of PFS. Patients were categorized according to the presence or absence of gBRCA or non-BRCA HRD-positive ovarian cancer or non-BRCA HRD-negative ovarian cancer, based on BRCAAnalysis testing (Myriad Genetics) from tumor and blood samples. Patients on niraparib had significantly longer median PFS duration compared with a placebo. [Level of evidence: 1iiDiii] Comparisons across categories ranged from HR, 0.27 for gBRCA cancer (21.0 months vs. 5.5 months), HR, 0.38 for non-BRCA cancer, HRD-positive cancer (12.9 months vs. 3.8 months), and HR, 0.45 for non-BRCA, HRD-negative cancer (9.3 months vs. 3.9 months). OS data were not mature at the time of this report, but deaths during the study occurred in 16.1% of patients on niraparib and 19.3% of patients on placebo. Grade 3 or 4 adverse events that were managed with dose modifications while patients were on niraparib included thrombocytopenia (in 33.8% of patients), anemia (in 25.3%), and neutropenia (in 19.6%). Other excess severe toxicities while patients were on niraparib that occurred at starting doses of 300 mg once daily included fatigue (in 30 patients vs. 1 patient on the placebo), hypertension (in 30 patients vs. 4 on the placebo), nausea (in 11 patients vs. 2 on the placebo), and vomiting (in 7 patients vs. 1 on the placebo). A phase III, randomized, double-blind, placebo-controlled study of niraparib maintenance in patients with HRD-positive advanced ovarian cancer following response to front-line platinum-based chemotherapy (NCT01847274) is closed to patient accrual and results are pending. Other PARP inhibitor trials have been exploring their role in platinum-resistant disease and their role in combination with other agents. Olaparib was also evaluated as a single agent in a multicenter phase II trial for patients with documented BRCA1- or BRCA2-germline mutations. [Level of evidence: 3iiiDiv] This trial was open to patients with platinum-resistant ovarian cancer, breast cancer treated with three or more previous regimens, pancreatic cancer with previously administered gemcitabine, or prostate cancer previously treated with hormonal therapy and one systemic therapy. Olaparib was given at 400 mg twice a day. The primary endpoint was response rate. A total of 298 patients were included. The data from this trial were used by the U.S. Food and Drug Administration to approve olaparib for patients with ovarian cancer, who have known BRCA1 or BRCA2 mutations and have failed three previous regimens. Several other trials have combined olaparib with either cytotoxic chemotherapy or other biologic therapy. [47,48] See Table 8. Extension in PFS, but not in OS, has been noted. AUC = area under the curve; BID = twice a day; No. = number; NR = not reported; PFS = progression-free survival; OS = overall survival. Between 1998 and 2006, a study led by the European Organization for the Research and Treatment of Cancer (EORTC) Gynecological Cancer Group, together with the National Cancer Institute of Canada Clinical Trials Group (EORTC-55971 [NCT00003636]), included 670 women with stages IIIC and IV ovarian epithelial cancer, FTC, and PPC. [Level of evidence: 1iiA] The women were randomly assigned to undergo primary debulking surgery followed by at least six courses of platinum-based chemotherapy or to receive three courses of neoadjuvant platinum-based chemotherapy followed by interval debulking surgery, and at least three more courses of platinum-based chemotherapy. Median OS for primary debulking surgery was 29 months, compared with 30 months for patients assigned to neoadjuvant chemotherapy. Perioperative and postoperative morbidity and mortality were higher in the primary debulking surgery group (7.4% severe hemorrhage and 2.5% deaths, compared with 4.1% severe hemorrhage and 0.7% deaths in the neoadjuvant group). The strongest independent predictor of prolonged survival was the absence of residual tumor after surgery. The subset of patients achieving optimal cytoreduction (≤1 cm residuum), whether after primary debulking surgery or after neoadjuvant chemotherapy followed by interval debulking surgery, had the best median OS. A minimization method was used to randomly assign patients in a 1:1 ratio. Participants were stratified by randomizing center, largest radiologic tumor, and prespecified chemotherapy regimen. The primary endpoint was to establish noninferiority, with the upper bound of a one-sided 90% CI for the HRdeath at less than 1.18. As of May 2014, 451 deaths had occurred, and the HRdeath favored NACT, with the upper bound of the one-sided 90% CI 0.98 (95% CI, 0.72‒1.05). The most common grade 3 or 4 postoperative adverse event was hemorrhage in both groups, with 8 women (3%) having this problem with PCS versus 14 (6%) in the NACT group. Grade 3 and 4 toxic events from chemotherapy occurred in 110 (49%) of 225 women randomly assigned to PCS, and in 102 (40%) of the 253 women receiving NACT, with one fatal event, neutropenic sepsis, occurring in the primary chemotherapy group. These studies and additional observational and partially published phase III studies have led to the publication of a Clinical Practice Guideline on behalf of the Society of Gynecologic Oncology and the American Society of Clinical Oncology. Yttrium-labeled radioimmunoconjugate plus IP chemotherapy. High-dose chemotherapy with hematopoietic support. A GOG study of 277 patients (GOG-178) compared 3 cycles versus 12 cycles of paclitaxel given every 4 weeks after a clinically defined complete response at the completion of platinum/paclitaxel induction. However, the study was stopped early because of a very significant difference in PFS (28 months for 12 cycles vs. 21 months for 3 cycles). [Level of evidence: 1iiDiii] Subsequent updates of these data have raised the possibility that a subset of patients with low CA-125 levels might show a survival benefit. A trial to confirm the value of maintenance with taxanes versus observation is being conducted by the GOG. A smaller Italian study randomly assigned 200 patients over 7 years to receive either 12 similar courses of monthly paclitaxel or observation. Patients were in clinical complete response (n = 95) or pathologic complete response (n = 105) after induction therapy at the time of their random assignment. Sensory neuropathy was the most prominent toxicity, and was grade 2 in 21.3% of the patients and grade 3 in 6.7% of patients. The median PFS for the maintenance paclitaxel arm was 34 months (95% CI, 20-43 months) and 30 months (95% CI, 17-53 months) for the observation arm. Neither PFS nor OS differences were significant. An accompanying editorial points out the weaknesses of both studies. Both stopped early and were noninformative for a survival endpoint. Also, although both studies addressed the issue of maintenance paclitaxel administered monthly, the patient populations differed. This was reflected by the considerably better outcome in both arms of the Italian study. Taken together, paclitaxel maintenance is of unproven value. Additional IP radioimmunoconjugates, vaccines, and targeted drugs are under clinical evaluation, primarily as consolidation therapy. Check the list of NCI-supported cancer clinical trials that are now accepting patients with stage II ovarian epithelial cancer, stage III ovarian epithelial cancer, stage IV ovarian epithelial cancer, fallopian tube cancer and primary peritoneal cavity cancer. The list of clinical trials can be further narrowed by location, drug, intervention, and other criteria. Hoskins WJ, McGuire WP, Brady MF, et al. : The effect of diameter of largest residual disease on survival after primary cytoreductive surgery in patients with suboptimal residual epithelial ovarian carcinoma. Am J Obstet Gynecol 170 (4): 974-9; discussion 979-80, 1994. Bristow RE, Tomacruz RS, Armstrong DK, et al. : Survival effect of maximal cytoreductive surgery for advanced ovarian carcinoma during the platinum era: a meta-analysis. J Clin Oncol 20 (5): 1248-59, 2002. Horowitz NS, Miller A, Rungruang B, et al. : Does aggressive surgery improve outcomes? Interaction between preoperative disease burden and complex surgery in patients with advanced-stage ovarian cancer: an analysis of GOG 182. J Clin Oncol 33 (8): 937-43, 2015. Armstrong DK, Bundy B, Wenzel L, et al. : Intraperitoneal cisplatin and paclitaxel in ovarian cancer. N Engl J Med 354 (1): 34-43, 2006. Markman M, Reichman B, Hakes T, et al. : Impact on survival of surgically defined favorable responses to salvage intraperitoneal chemotherapy in small-volume residual ovarian cancer. J Clin Oncol 10 (9): 1479-84, 1992. Markman M: Intraperitoneal chemotherapy. Semin Oncol 18 (3): 248-54, 1991. Levin L, Simon R, Hryniuk W: Importance of multiagent chemotherapy regimens in ovarian carcinoma: dose intensity analysis. J Natl Cancer Inst 85 (21): 1732-42, 1993. McGuire WP, Hoskins WJ, Brady MF, et al. : Assessment of dose-intensive therapy in suboptimally debulked ovarian cancer: a Gynecologic Oncology Group study. J Clin Oncol 13 (7): 1589-99, 1995. Bolis G, Favalli G, Danese S, et al. : Weekly cisplatin given for 2 months versus cisplatin plus cyclophosphamide given for 5 months after cytoreductive surgery for advanced ovarian cancer. J Clin Oncol 15 (5): 1938-44, 1997. Alberts DS, Green S, Hannigan EV, et al. : Improved therapeutic index of carboplatin plus cyclophosphamide versus cisplatin plus cyclophosphamide: final report by the Southwest Oncology Group of a phase III randomized trial in stages III and IV ovarian cancer. J Clin Oncol 10 (5): 706-17, 1992.
du Bois A, Lück HJ, Meier W, et al. : A randomized clinical trial of cisplatin/paclitaxel versus carboplatin/paclitaxel as first-line treatment of ovarian cancer. J Natl Cancer Inst 95 (17): 1320-9, 2003. Neijt JP, Engelholm SA, Tuxen MK, et al. : Exploratory phase III study of paclitaxel and cisplatin versus paclitaxel and carboplatin in advanced ovarian cancer. J Clin Oncol 18 (17): 3084-92, 2000. Muggia FM, Braly PS, Brady MF, et al. : Phase III randomized study of cisplatin versus paclitaxel versus cisplatin and paclitaxel in patients with suboptimal stage III or IV ovarian cancer: a gynecologic oncology group study. J Clin Oncol 18 (1): 106-15, 2000. The International Collaborative Ovarian Neoplasm Group: Paclitaxel plus carboplatin versus standard chemotherapy with either single-agent carboplatin or cyclophosphamide, doxorubicin, and cisplatin in women with ovarian cancer: the ICON3 randomised trial. Lancet 360 (9332): 505-15, 2002. Ozols RF, Bundy BN, Greer BE, et al. : Phase III trial of carboplatin and paclitaxel compared with cisplatin and paclitaxel in patients with optimally resected stage III ovarian cancer: a Gynecologic Oncology Group study. J Clin Oncol 21 (17): 3194-200, 2003. Vasey PA, Jayson GC, Gordon A, et al. : Phase III randomized trial of docetaxel-carboplatin versus paclitaxel-carboplatin as first-line chemotherapy for ovarian carcinoma. J Natl Cancer Inst 96 (22): 1682-91, 2004. Kristensen GB, Vergote I, Stuart G, et al. : First-line treatment of ovarian cancer FIGO stages IIb-IV with paclitaxel/epirubicin/carboplatin versus paclitaxel/carboplatin. Int J Gynecol Cancer 13 (Suppl 2): 172-7, 2003 Nov-Dec.
Bookman MA, Brady MF, McGuire WP, et al. : Evaluation of new platinum-based treatment regimens in advanced-stage ovarian cancer: a Phase III Trial of the Gynecologic Cancer Intergroup. J Clin Oncol 27 (9): 1419-25, 2009. Hoskins PJ: Triple cytotoxic therapy for advanced ovarian cancer: a failed application, not a failed strategy. J Clin Oncol 27 (9): 1355-8, 2009. Harano K, Terauchi F, Katsumata N, et al. : Quality-of-life outcomes from a randomized phase III trial of dose-dense weekly paclitaxel and carboplatin compared with conventional paclitaxel and carboplatin as a first-line treatment for stage II-IV ovarian cancer: Japanese Gynecologic Oncology Group Trial (JGOG3016). Ann Oncol 25 (1): 251-7, 2014. Pignata S, Scambia G, Katsaros D, et al. : Carboplatin plus paclitaxel once a week versus every 3 weeks in patients with advanced ovarian cancer (MITO-7): a randomised, multicentre, open-label, phase 3 trial. Lancet Oncol 15 (4): 396-405, 2014. McGuire WP, Hoskins WJ, Brady MF, et al. : Cyclophosphamide and cisplatin compared with paclitaxel and cisplatin in patients with stage III and stage IV ovarian cancer. N Engl J Med 334 (1): 1-6, 1996. Mahner S, Burges A: Quality of life as a primary endpoint in ovarian cancer trials. Lancet Oncol 15 (4): 363-4, 2014. Oza AM, Cook AD, Pfisterer J, et al. : Standard chemotherapy with or without bevacizumab for women with newly diagnosed ovarian cancer (ICON7): overall survival results of a phase 3 randomised trial. Lancet Oncol 16 (8): 928-36, 2015. Howell SB, Zimm S, Markman M, et al. : Long-term survival of advanced refractory ovarian carcinoma patients with small-volume disease treated with intraperitoneal chemotherapy. J Clin Oncol 5 (10): 1607-12, 1987. Sugarbaker PH: Laboratory and clinical basis for hyperthermia as a component of intracavitary chemotherapy. Int J Hyperthermia 23 (5): 431-42, 2007. Oseledchyk A, Zivanovic O: Intraoperative Hyperthermic Intraperitoneal Chemotherapy in Patients With Advanced Ovarian Cancer. Oncology (Williston Park) 29 (9): 695-701, 2015. Alberts DS, Liu PY, Hannigan EV, et al. : Intraperitoneal cisplatin plus intravenous cyclophosphamide versus intravenous cisplatin plus intravenous cyclophosphamide for stage III ovarian cancer. N Engl J Med 335 (26): 1950-5, 1996. Markman M, Bundy BN, Alberts DS, et al. : Phase III trial of standard-dose intravenous cisplatin plus paclitaxel versus moderately high-dose carboplatin followed by intravenous paclitaxel and intraperitoneal cisplatin in small-volume stage III ovarian carcinoma: an intergroup study of the Gynecologic Oncology Group, Southwestern Oncology Group, and Eastern Cooperative Oncology Group. J Clin Oncol 19 (4): 1001-7, 2001. Tewari D, Java JJ, Salani R, et al. : Long-term survival advantage and prognostic factors associated with intraperitoneal chemotherapy treatment in advanced ovarian cancer: a gynecologic oncology group study. J Clin Oncol 33 (13): 1460-6, 2015. Jaaback K, Johnson N: Intraperitoneal chemotherapy for the initial management of primary epithelial ovarian cancer. Cochrane Database Syst Rev (1): CD005340, 2006. Elit L, Oliver TK, Covens A, et al. : Intraperitoneal chemotherapy in the first-line treatment of women with stage III epithelial ovarian cancer: a systematic review with metaanalyses. Cancer 109 (4): 692-702, 2007. Burger RA, Brady MF, Bookman MA, et al. : Incorporation of bevacizumab in the primary treatment of ovarian cancer. N Engl J Med 365 (26): 2473-83, 2011. Perren TJ, Swart AM, Pfisterer J, et al. : A phase 3 trial of bevacizumab in ovarian cancer. N Engl J Med 365 (26): 2484-96, 2011. Bryant HE, Schultz N, Thomas HD, et al. : Specific killing of BRCA2-deficient tumours with inhibitors of poly(ADP-ribose) polymerase. Nature 434 (7035): 913-7, 2005. Farmer H, McCabe N, Lord CJ, et al. : Targeting the DNA repair defect in BRCA mutant cells as a therapeutic strategy. Nature 434 (7035): 917-21, 2005. Ledermann J, Harter P, Gourley C, et al. : Olaparib maintenance therapy in platinum-sensitive relapsed ovarian cancer. N Engl J Med 366 (15): 1382-92, 2012. Ledermann J, Harter P, Gourley C, et al. : Olaparib maintenance therapy in patients with platinum-sensitive relapsed serous ovarian cancer: a preplanned retrospective analysis of outcomes by BRCA status in a randomised phase 2 trial. Lancet Oncol 15 (8): 852-61, 2014. Mirza MR, Monk BJ, Herrstedt J, et al. : Niraparib Maintenance Therapy in Platinum-Sensitive, Recurrent Ovarian Cancer. N Engl J Med 375 (22): 2154-2164, 2016. Kaufman B, Shapira-Frommer R, Schmutzler RK, et al. : Olaparib monotherapy in patients with advanced cancer and a germline BRCA1/2 mutation. J Clin Oncol 33 (3): 244-50, 2015. Liu JF, Barry WT, Birrer M, et al. : Combination cediranib and olaparib versus olaparib alone for women with recurrent platinum-sensitive ovarian cancer: a randomised phase 2 study. Lancet Oncol 15 (11): 1207-14, 2014. Oza AM, Cibula D, Benzaquen AO, et al. : Olaparib combined with chemotherapy for recurrent platinum-sensitive ovarian cancer: a randomised phase 2 trial. Lancet Oncol 16 (1): 87-97, 2015. Vergote I, Tropé CG, Amant F, et al. : Neoadjuvant chemotherapy or primary surgery in stage IIIC or IV ovarian cancer. N Engl J Med 363 (10): 943-53, 2010. Kehoe S, Hook J, Nankivell M, et al. : Primary chemotherapy versus primary surgery for newly diagnosed advanced ovarian cancer (CHORUS): an open-label, randomised, controlled, non-inferiority trial. Lancet 386 (9990): 249-57, 2015. Wright AA, Bohlke K, Armstrong DK, et al. : Neoadjuvant chemotherapy for newly diagnosed, advanced ovarian cancer: Society of Gynecologic Oncology and American Society of Clinical Oncology Clinical Practice Guideline. Gynecol Oncol 143 (1): 3-15, 2016. Piccart MJ, Bertelsen K, James K, et al. : Randomized intergroup trial of cisplatin-paclitaxel versus cisplatin-cyclophosphamide in women with advanced epithelial ovarian cancer: three-year results. J Natl Cancer Inst 92 (9): 699-708, 2000. Verheijen RH, Massuger LF, Benigno BB, et al. : Phase III trial of intraperitoneal therapy with yttrium-90-labeled HMFG1 murine monoclonal antibody in patients with epithelial ovarian cancer after a surgically defined complete remission. J Clin Oncol 24 (4): 571-8, 2006. Pfisterer J, Weber B, Reuss A, et al. : Randomized phase III trial of topotecan following carboplatin and paclitaxel in first-line treatment of advanced ovarian cancer: a gynecologic cancer intergroup trial of the AGO-OVAR and GINECO. J Natl Cancer Inst 98 (15): 1036-45, 2006. Berek JS, Taylor PT, Gordon A, et al. : Randomized, placebo-controlled study of oregovomab for consolidation of clinical remission in patients with advanced ovarian cancer. J Clin Oncol 22 (17): 3507-16, 2004. Stadtmauer EA, O'Neill A, Goldstein LJ, et al. : Phase III randomized trial of high-dose chemotherapy (HDC) and stem cell support (SCT) shows no difference in overall survival or severe toxicity compared to maintenance chemotherapy with cyclophosphamide, methotrexate and 5-fluorourcil (CMF) for women with metastatic breast cancer who are responding to conventional induction chemotherapy: the 'Philadelphia' Intergroup study (PBT-1). [Abstract] Proceedings of the American Society of Clinical Oncology 18: A1, 1a, 1999. Markman M, Liu PY, Wilczynski S, et al. : Phase III randomized trial of 12 versus 3 months of maintenance paclitaxel in patients with advanced ovarian cancer after complete response to platinum and paclitaxel-based chemotherapy: a Southwest Oncology Group and Gynecologic Oncology Group trial. J Clin Oncol 21 (13): 2460-5, 2003. Pecorelli S, Favalli G, Gadducci A, et al. : Phase III trial of observation versus six courses of paclitaxel in patients with advanced epithelial ovarian cancer in complete response after six courses of paclitaxel/platinum-based chemotherapy: final results of the After-6 protocol 1. J Clin Oncol 27 (28): 4642-8, 2009. Vergote IB, Jimeno A, Joly F, et al. : Randomized phase III study of erlotinib versus observation in patients with no evidence of disease progression after first-line platin-based chemotherapy for ovarian carcinoma: a European Organisation for Research and Treatment of Cancer-Gynaecological Cancer Group, and Gynecologic Cancer Intergroup study. J Clin Oncol 32 (4): 320-6, 2014. Liu PY, Alberts DS, Monk BJ, et al. : An early signal of CA-125 progression for ovarian cancer patients receiving maintenance treatment after complete clinical response to primary therapy. J Clin Oncol 25 (24): 3615-20, 2007. McGuire WP: Maintenance therapy for ovarian cancer: of Helsinki and Hippocrates. J Clin Oncol 27 (28): 4633-4, 2009. Overall, approximately 80% of patients diagnosed with ovarian epithelial cancer, fallopian tube cancer (FTC), and primary peritoneal cancer (PPC) will relapse after first-line platinum-based and taxane-based chemotherapy and may benefit from subsequent therapies. Early detection of persistent disease by second-look laparotomies after completion of first-line treatment is no longer practiced. When the outcomes in institutions practicing such procedures (50% of institutions) were informally compared with the outcomes in institutions not using such procedures, lack of support for second-look laparotomies grew. This was confirmed in the GOG-0158 trial. On the other hand, the practice of close follow-up of patients completing treatment by measuring CA-125 levels at intervals of 1 to 3 months was nearly universally adopted. In patients who are in clinical complete remission, increases in CA-125 from their initial treatment represent the most common method to detect disease that will eventually relapse clinically. Treatment based on abnormal increases in CA-125 in the absence of symptoms or imaging evidence of disease has been addressed in a clinical trial. A trial by the Medical Research Council (MRC) and the EORTC (MRC-OV05) examined the consequences of early treatment for an elevated CA-125 level versus treatment delayed until clinical symptoms appeared. Patients in clinical complete remission after platinum-based chemotherapy were registered and followed with CA-125 levels and clinical visits only. Upon detection of a twofold elevation over the normal range, patients were randomly assigned to disclosure of the result and early treatment for recurrence versus continued blinding and treatment upon development of signs and symptoms indicative of clinical relapse. The number of randomly assigned patients was to exceed 500 to yield a superior survival outcome at 2 years with early institution of therapy; this required 1,400 registrations, which were accrued between May 1996 and August 2005. Among 1,442 patients, 29% continued to show no evidence of relapse; however, in 19% of patients, the CA-125 level was noninformative at clinical relapse, or a doubling occurred concurrently with clinical relapse. Patients had stage III and stage IV disease in 67% of the cases; however, these stages represented 80% of the patients with a twofold or higher increase in CA-125 level who subsequently were randomly assigned. The median survival of all patients registered was 70.8 months. Median survival for patients randomly assigned to early treatment (n = 265) was 25.7 months compared with 27.1 months for patients in the delayed-treatment group (n = 264) (hazard ratio [HR], 0.98; 95% confidence interval [CI], 0.8-1.2). The median delay in instituting second-line chemotherapy was 4.8 months, and the median delay in instituting third-line chemotherapy was 4.6 months. Second-line chemotherapy treatments were comparable among the two groups (mostly platinum- and taxane-based), whereas third-line treatments were less often applied to the delayed-treatment group. The study concluded that there was no benefit in the detection of early presence of disease by CA-125. This finding is consistent with the failure of second-look surgeries to provide improved outcomes after early detection of persistent disease. Monitoring CA-125 levels in follow-up may play a role in identifying appropriate candidates for secondary cytoreduction, although this strategy awaits confirmation with a randomized trial. Platinum-sensitive recurrence: For patients whose disease recurs more than 6 months after cessation of the induction, re-treatment with a platinum or platinum-containing combination, such as carboplatin, should be considered (see Table 9). Platinum-refractory or platinum-resistant recurrence: For patients who progress before cessation of induction therapy (platinum refractory) or within 6 months after cessation of induction therapy (platinum resistant), (platinum therapy is generally not useful as part of the treatment plan. Clinical trials should be considered. Other agents that have shown activity in phase II trials are listed in Table 10 and may also be used alone or in combination with other drugs, but such treatments are best done in prospective trials. Cytoreduction may be used; and this intervention is being studied in the setting of a randomized clinical trial (GOG-0213). The role of radiation therapy in patients with recurrent ovarian cancer has not been defined. Table 9 shows the chemotherapy regimens used in first relapse for the treatment of platinum-sensitive recurrent ovarian cancer. No. = number; OS = overall survival; PFS = progression-free survival. a Trabectedin has been approved for use in treating recurrent ovarian cancer in Europe and Canada. b OS data were not mature at the time the manuscript was published. On the basis of improved survival with etoposide or 5-fluorouracil, carboplatin was approved in 1987 for the treatment of patients with ovarian cancer whose disease recurred after treatment with cisplatin. In a randomized phase II trial of paclitaxel, a currently used second-line drug, the cisplatin-containing combination of cisplatin plus doxorubicin plus cyclophosphamide (CAP), yielded a superior survival outcome. This study and subsequent studies (see Table 9), have reinforced the use of carboplatin as the treatment core for patients with platinum-sensitive recurrences. Cisplatin is occasionally used, particularly in combination with other drugs, because of its lesser myelosuppression, but this advantage over carboplatin is counterbalanced by greater patient intolerance. Oxaliplatin, initially introduced with the hope that it would overcome platinum resistance, has activity mostly in platinum-sensitive patients  but has not been compared with carboplatin alone or in combinations. With all platinum agents, outcome is generally better the longer the initial interval without recurrence from the initial platinum-containing regimens. Therefore, on occasion, patients with platinum-sensitive recurrences relapsing within 1 year have been included in trials of nonplatinum drugs. In one such trial, comparing the pegylated liposomal doxorubicin to topotecan, the subset of patients who were platinum sensitive had better outcomes with either drug (and in particular with pegylated liposomal doxorubicin) relative to the platinum-resistant cohort. Several randomized trials have addressed whether the use of a platinum in combination with other chemotherapy agents is superior to single agents (see Table 9). A platinum-plus-paclitaxel combination yielded superior response rates, progression-free survival (PFS), and overall survival (OS), compared with carboplatin as a single agent or other platinum-containing combinations as controls. The AGO had previously compared the combination of epirubicin plus carboplatin with carboplatin alone and had not found significant differences in outcome. A meta-analysis of five trials (three of which are in Table 9), with four reviewing independent patient data, supports the use of platinum agents in combination with other active agents rather than carboplatin alone for patients with platinum-sensitive recurrent ovarian cancer. Another trial by European and Canadian groups compared gemcitabine plus carboplatin to carboplatin. The study was not powered to detect significant differences in OS, and the median survival for both arms was 18 months (HR, 0.96; CI, 0.75-1.23; P = .73). In a phase III trial, carboplatin plus pegylated liposomal doxorubicin was compared with carboplatin plus paclitaxel in patients with platinum-sensitive recurrence (>6 months). The primary endpoint was PFS. Long-term follow-up revealed no difference in OS rates between the two arms (30.7 months for carboplatin plus pegylated liposomal doxorubicin vs. 33.0 months for carboplatin plus paclitaxel). The carboplatin-plus-paclitaxel arm was associated with increased severe neutropenia, alopecia, neuropathy, and allergic reaction. The carboplatin-plus-pegylated-liposomal-doxorubicin arm was associated with increased severe thrombocytopenia, nausea, and hand-foot syndrome. Given its toxicity profile and noninferiority to the standard regimen, carboplatin plus pegylated liposomal doxorubicin is an important option for patients with platinum-sensitive recurrence. Carboplatin plus paclitaxel has been considered the standard regimen for platinum-sensitive recurrence in the absence of residual neurological toxic effects. The GOG-0213 trial is comparing this regimen with the experimental arm that adds bevacizumab to carboplatin plus paclitaxel. The Ovarian Cancer Study Comparing Efficacy and Safety of Chemotherapy and Anti-Angiogenic Therapy in Platinum-Sensitive Recurrent Diseases (OCEANS [NCT00434642]), assessed the role of bevacizumab in the treatment of platinum-sensitive recurrence (see Table 9 for other trials in this setting). In this double-blind, placebo-controlled, phase III trial of chemotherapy (gemcitabine + carboplatin) with or without bevacizumab for recurrent ovarian epithelial cancer, FTC, or PPC, 242 patients were randomly assigned to each arm. In contrast to the first-line studies, treatment was allowed to continue beyond six cycles to ten cycles in responding patients, but there was no maintenance therapy. A subsequent analysis will appear when additional survival data become mature; however, at the time of publication, differences in median OS were not apparent, and crossover from a placebo to bevacizumab had occurred in 31% of the patients. Median PFS for patients receiving bevacizumab was 12.4 months versus 8.4 months for those receiving a placebo. The HR for the effect of bevacizumab on disease progression in patients assigned to the bevacizumab arm compared with placebo was 0.484 (95% CI, 0.388-0.605; P < .0001). Objective responses to chemotherapy were increased when combined with bevacizumab (78.5% vs. 57.4%; P < .0001). Bevacizumab-associated toxicities such as hypertension and proteinuria were more prominent than in the first-line trials, but feared safety issues such as gastrointestinal perforations did not occur during the study. Discontinuing treatment because of adverse events was more common with bevacizumab (n = 55 vs. n = 12 for placebo), but fewer patients discontinued treatment because of disease progression (n = 104 for bevacizumab vs. n = 160 for placebo). Clinical recurrences that take place within 6 months of completion of a platinum-containing regimen are considered platinum-refractory or platinum-resistant recurrences. Anthracyclines (particularly when formulated as pegylated liposomal doxorubicin), taxanes, topotecan, and gemcitabine are used as single agents for these recurrences on the basis of activity and their favorable therapeutic indices relative to agents listed in Table 10. The long list underscores the marginal benefit, if any, of these agents. Clinical trials should be considered for patients with platinum-resistant disease. Treatment with paclitaxel historically provided the first agent with consistent activity in patients with platinum-refractory or platinum-resistant recurrences. [17,18,19,20,21] Patients generally received paclitaxel in front-line induction regimens. Re-treatment with paclitaxel, particularly in weekly schedules, had activity comparable with that of other drugs. Residual neuropathy upon recurrence may shift the choice of treatment towards other agents. Randomized studies have indicated that the use of topotecan achieved results that were comparable with those achieved with paclitaxel. Topotecan was compared with pegylated liposomal doxorubicin in a randomized trial of 474 patients and demonstrated similar response rates, PFS, and OS at the time of the initial report. Responses occurred primarily in the platinum-resistant subsets. Objective responses were reported in patients with platinum-refractory disease. Substantial myelosuppression followed administration. Other toxic effects included nausea, vomiting, alopecia, and asthenia. A number of schedules and oral formulations to reduce toxicity are under evaluation. The overall objective response rate was 20.5% for patients who were randomly assigned to treatment with topotecan and 13.2% for patients who were randomly assigned to treatment with paclitaxel (P = .138). Both groups experienced myelosuppression and gastrointestinal (GI) toxic effects. Nausea and vomiting, fatigue, and infection were observed more commonly after treatment with topotecan, whereas alopecia, arthralgia, myalgia, and neuropathy were observed more commonly after treatment with paclitaxel. The combination of weekly topotecan and biweekly bevacizumab was evaluated in a phase II study. Results showed an objective response rate of 25% (all partial responses) in a platinum-resistant patient population. The most common grade 3 and grade 4 toxicities were hypertension, neutropenia, and GI toxicity, though no bowel perforations occurred. In a phase II study encapsulated doxorubicin was given intravenously (IV) once every 21 to 28 days. Results demonstrated one complete response and eight partial responses in 35 patients with platinum-refractory or paclitaxel-refractory disease (response rate, 25.7%). In general, liposomal doxorubicin has few acute side effects other than hypersensitivity. The most frequent toxic effects (stomatitis and hand-foot syndrome) were usually observed after the first cycle, and were more pronounced after dose rates exceeded 10 mg/m2 per week. Neutropenia and nausea were minimal, and alopecia rarely occurred. Survival was longer for the patients with platinum-sensitive disease who received pegylated liposomal doxorubicin. This drug has shown activity in paclitaxel-pretreated patients and is a reasonable alternative to weekly paclitaxel in the recurrent setting. The response rate ranges from 13% to 19% in evaluable patients. Responses have been observed in patients whose disease is platinum refractory and/or paclitaxel refractory as well as in patients with bulky disease. Leukopenia, anemia, and thrombocytopenia were the most common toxic effects. Many patients reported transient flu-like symptoms and a rash after drug administration. Other toxic effects, including nausea, were usually mild. A randomized trial of gemcitabine versus pegylated liposomal doxorubicin showed noninferiority and no advantage in therapeutic index of one drug over the other. Chemotherapy with or without bevacizumab. The U.S. Food and Drug Administration has approved the use of bevacizumab in combination with pegylated liposomal doxorubicin, paclitaxel, or topotecan as a result of the OCEANS and AURELIA trials. Pegylated liposomal doxorubicin 40 mg/m2 by IV on day 1 every 4 weeks. Paclitaxel 80 mg/m2 by IV on days 1, 8, 15, and 22 every 4 weeks. Topotecan 4 mg/m2 by IV on days 1, 8, and 15 every 4 weeks; or 1.25 mg/m2 by IV on days 1 through 5 every 3 weeks. Patients were then randomly assigned to receive either chemotherapy alone or chemotherapy with bevacizumab (10 mg/kg every 2 weeks, or 15 mg/kg every 3 weeks if on the 3-week-dosing schedule). Crossover to a bevacizumab-containing regimen was allowed at progression for those patients in the chemotherapy-only arm. PFS was the primary outcome, with response rate, OS, safety, and quality of life used as secondary endpoints. The enrollment included 361 patients with a median follow-up of 13.9 months in the chemotherapy-only arm and 13.0 months in the chemotherapy-plus-bevacizumab arm. Patients in the bevacizumab arm exhibited longer PFS (HR, 0.48; 95% CI, 0.38 to 0.60); median PFS was 3.4 months in the chemotherapy alone arm versus 6.7 months in the chemotherapy plus bevacizumab arm. The objective response rate was 12.6% in the chemotherapy-alone arm versus 30.9% in the chemotherapy-plus-bevacizumab arm. There was no statistically significant difference in OS between the regimens (13.3 months chemotherapy alone vs. 16.6 months chemotherapy plus bevacizumab). Patients in the chemotherapy-plus-bevacizumab arm had an increased incidence of hypertension and proteinuria, when compared with patients in the chemotherapy-only arm. GI perforation occurred in 2% in those receiving chemotherapy plus bevacizumab, which reflects the study's stringent exclusion criteria. The primary endpoint for the quality-of-life portion of the study was a 15% or greater absolute improvement in the abdominal and GI symptom portion of the assessment modules at week 8 to week 9 of the protocol for patients in the chemotherapy plus bevacizumab arm. [Level of Evidence: 1iC] The study used patient-reported outcomes from the European Organization for Research and Treatment of Cancer (EORTC) Ovarian Cancer Module 28 and the Functional Assessment of Cancer Therapy-Ovarian Cancer symptom index at baseline and every 8 to 9 weeks until disease progression. Although there were some limitations in study design, more patients on the chemotherapy-plus-bevacizumab arm had 15% or greater improvement in their GI scores when compared with baseline. For the chemotherapy-plus-bevacizumab arm, 34 of 115 patients (29.6%) showed improvement versus 15 of 118 (12.7%) patients who showed improvement on the chemotherapy-alone arm (difference, 16.9%; 95% CI, 6.1%-27.6%; P = .002). These studies confirm the effect of improving PFS when bevacizumab is added to chemotherapy for ovarian cancer. In the OCEANS trial, the HR for progression was even more prominent than in the first-line trials, and a significant effect was seen when the bevacizumab-chemotherapy combination was extended beyond six cycles until progression. In summary, the improvement achieved by bevacizumab in relative risk and PFS rates in platinum-sensitive and platinum-resistant recurrences has been consistently more than the improvement achieved with chemotherapy alone; however, bevacizumab-related toxic effects must be considered. Three phase II studies have shown activity for this antibody to vascular endothelial growth factor (VEGF). The first study (GOG-0170D) included 62 patients who had received only one or two previous treatments. These last patients had received one additional platinum-based regimen because of an initial interval of 12 months or longer after first-line regimens and also had to have a performance status of 0 or 1. Patients received a dose of 15 mg/kg every 21 days. There were 2 complete responses and 11 partial responses, a median PFS of 4.7 months, and an OS of 17 months. This activity was noted in both platinum-sensitive and platinum-resistant subsets. The second study included only patients with platinum-resistant disease using an identical dose schedule. The third study (CCC-PHII-45) included 70 patients who received 50 mg of oral cyclophosphamide daily, in addition to bevacizumab (10 mg/kg every 2 wk). Partial responses were observed in 17 patients, and 4 patients had intestinal perforations. A randomized double-blinded phase II European trial with 102 patients evaluated pemetrexed at two doses: standard-dose (500 mg/m2) versus high-dose (900 mg/m2) IV every 3 weeks. The response rate was 9.3% for the standard dose and 10.4% for the high dose. The toxicity profile favored the standard dose, with fatigue, nausea, and vomiting as the most common severe toxicities. A phase II study by the Gynecologic Oncology Group utilized pemetrexed (900 mg/m2) IV every 3 weeks in 51 patients with platinum-resistant recurrent disease. The response rate was 21% in a heavily pretreated population in which 39% of the patients had received five or more regimens previously. Myelosuppression and fatigue were the most common severe toxicities. The drugs shown in Table 10 are not fully confirmed to have activity in a platinum-resistant setting, have a less desirable therapeutic index, and have a level of evidence lower than 3iiiDiv. Check the list of NCI-supported cancer clinical trials that are now accepting patients with recurrent ovarian epithelial cancer, fallopian tube cancer and primary peritoneal cavity cancer. The list of clinical trials can be further narrowed by location, drug, intervention, and other criteria. Hoskins WJ, Rubin SC, Dulaney E, et al. : Influence of secondary cytoreduction at the time of second-look laparotomy on the survival of patients with epithelial ovarian carcinoma. Gynecol Oncol 34 (3): 365-71, 1989. Monk BJ, Herzog TJ, Kaye SB, et al. : Trabectedin plus pegylated liposomal Doxorubicin in recurrent ovarian cancer. J Clin Oncol 28 (19): 3107-14, 2010. Parmar MK, Ledermann JA, Colombo N, et al. : Paclitaxel plus platinum-based chemotherapy versus conventional platinum-based chemotherapy in women with relapsed ovarian cancer: the ICON4/AGO-OVAR-2.2 trial. Lancet 361 (9375): 2099-106, 2003. Pfisterer J, Plante M, Vergote I, et al. : Gemcitabine plus carboplatin compared with carboplatin in patients with platinum-sensitive recurrent ovarian cancer: an intergroup trial of the AGO-OVAR, the NCIC CTG, and the EORTC GCG. J Clin Oncol 24 (29): 4699-707, 2006. Wagner U, Marth C, Largillier R, et al. : Final overall survival results of phase III GCIG CALYPSO trial of pegylated liposomal doxorubicin and carboplatin vs paclitaxel and carboplatin in platinum-sensitive ovarian cancer patients. Br J Cancer 107 (4): 588-91, 2012. Bolis G, Scarfone G, Giardina G, et al. : Carboplatin alone vs carboplatin plus epidoxorubicin as second-line therapy for cisplatin- or carboplatin-sensitive ovarian cancer. Gynecol Oncol 81 (1): 3-9, 2001. Cantù MG, Buda A, Parma G, et al. : Randomized controlled trial of single-agent paclitaxel versus cyclophosphamide, doxorubicin, and cisplatin in patients with recurrent ovarian cancer who responded to first-line platinum-based regimens. J Clin Oncol 20 (5): 1232-7, 2002. Muggia FM: Overview of carboplatin: replacing, complementing, and extending the therapeutic horizons of cisplatin. Semin Oncol 16 (2 Suppl 5): 7-13, 1989. Piccart MJ, Green JA, Lacave AJ, et al. : Oxaliplatin or paclitaxel in patients with platinum-pretreated advanced ovarian cancer: A randomized phase II study of the European Organization for Research and Treatment of Cancer Gynecology Group. J Clin Oncol 18 (6): 1193-202, 2000. Markman M, Markman J, Webster K, et al. : Duration of response to second-line, platinum-based chemotherapy for ovarian cancer: implications for patient management and clinical trial design. J Clin Oncol 22 (15): 3120-5, 2004. Gordon AN, Tonda M, Sun S, et al. : Long-term survival advantage for women treated with pegylated liposomal doxorubicin compared with topotecan in a phase 3 randomized study of recurrent and refractory epithelial ovarian cancer. Gynecol Oncol 95 (1): 1-8, 2004. Raja FA, Counsell N, Colombo N, et al. : Platinum versus platinum-combination chemotherapy in platinum-sensitive recurrent ovarian cancer: a meta-analysis using individual patient data. Ann Oncol 24 (12): 3028-34, 2013. Pujade-Lauraine E, Wagner U, Aavall-Lundqvist E, et al. : Pegylated liposomal Doxorubicin and Carboplatin compared with Paclitaxel and Carboplatin for patients with platinum-sensitive ovarian cancer in late relapse. J Clin Oncol 28 (20): 3323-9, 2010. Aghajanian C, Blank SV, Goff BA, et al. : OCEANS: a randomized, double-blind, placebo-controlled phase III trial of chemotherapy with or without bevacizumab in patients with platinum-sensitive recurrent epithelial ovarian, primary peritoneal, or fallopian tube cancer. J Clin Oncol 30 (17): 2039-45, 2012. Kohn EC, Sarosy G, Bicher A, et al. : Dose-intense taxol: high response rate in patients with platinum-resistant recurrent ovarian cancer. J Natl Cancer Inst 86 (1): 18-24, 1994. McGuire WP, Rowinsky EK, Rosenshein NB, et al. : Taxol: a unique antineoplastic agent with significant activity in advanced ovarian epithelial neoplasms. Ann Intern Med 111 (4): 273-9, 1989. Einzig AI, Wiernik PH, Sasloff J, et al. : Phase II study and long-term follow-up of patients treated with taxol for advanced ovarian adenocarcinoma. J Clin Oncol 10 (11): 1748-53, 1992. Thigpen JT, Blessing JA, Ball H, et al. : Phase II trial of paclitaxel in patients with progressive ovarian carcinoma after platinum-based chemotherapy: a Gynecologic Oncology Group study. J Clin Oncol 12 (9): 1748-53, 1994. Trimble EL, Adams JD, Vena D, et al. : Paclitaxel for platinum-refractory ovarian cancer: results from the first 1,000 patients registered to National Cancer Institute Treatment Referral Center 9103. J Clin Oncol 11 (12): 2405-10, 1993.
ten Bokkel Huinink W, Gore M, Carmichael J, et al. : Topotecan versus paclitaxel for the treatment of recurrent epithelial ovarian cancer. J Clin Oncol 15 (6): 2183-93, 1997. Gordon AN, Fleagle JT, Guthrie D, et al. : Recurrent epithelial ovarian carcinoma: a randomized phase III study of pegylated liposomal doxorubicin versus topotecan. J Clin Oncol 19 (14): 3312-22, 2001. Kudelka AP, Tresukosol D, Edwards CL, et al. : Phase II study of intravenous topotecan as a 5-day infusion for refractory epithelial ovarian carcinoma. J Clin Oncol 14 (5): 1552-7, 1996. Creemers GJ, Bolis G, Gore M, et al. : Topotecan, an active drug in the second-line treatment of epithelial ovarian cancer: results of a large European phase II study. J Clin Oncol 14 (12): 3056-61, 1996. Bookman MA, Malmström H, Bolis G, et al. : Topotecan for the treatment of advanced epithelial ovarian cancer: an open-label phase II study in patients treated after prior chemotherapy that contained cisplatin or carboplatin and paclitaxel. J Clin Oncol 16 (10): 3345-52, 1998. McGonigle KF, Muntz HG, Vuky J, et al. : Combined weekly topotecan and biweekly bevacizumab in women with platinum-resistant ovarian, peritoneal, or fallopian tube cancer: results of a phase 2 study. Cancer 117 (16): 3731-40, 2011. Muggia FM, Hainsworth JD, Jeffers S, et al. : Phase II study of liposomal doxorubicin in refractory ovarian cancer: antitumor activity and toxicity modification by liposomal encapsulation. J Clin Oncol 15 (3): 987-93, 1997. Berkenblit A, Seiden MV, Matulonis UA, et al. : A phase II trial of weekly docetaxel in patients with platinum-resistant epithelial ovarian, primary peritoneal serous cancer, or fallopian tube cancer. Gynecol Oncol 95 (3): 624-31, 2004. Friedlander M, Millward MJ, Bell D, et al. : A phase II study of gemcitabine in platinum pre-treated patients with advanced epithelial ovarian cancer. Ann Oncol 9 (12): 1343-5, 1998. Lund B, Hansen OP, Theilade K, et al. : Phase II study of gemcitabine (2',2'-difluorodeoxycytidine) in previously treated ovarian cancer patients. J Natl Cancer Inst 86 (20): 1530-3, 1994. Shapiro JD, Millward MJ, Rischin D, et al. : Activity of gemcitabine in patients with advanced ovarian cancer: responses seen following platinum and paclitaxel. Gynecol Oncol 63 (1): 89-93, 1996. Mutch DG, Orlando M, Goss T, et al. : Randomized phase III trial of gemcitabine compared with pegylated liposomal doxorubicin in patients with platinum-resistant ovarian cancer. J Clin Oncol 25 (19): 2811-8, 2007. Pujade-Lauraine E, Hilpert F, Weber B, et al. : Bevacizumab combined with chemotherapy for platinum-resistant recurrent ovarian cancer: The AURELIA open-label randomized phase III trial. J Clin Oncol 32 (13): 1302-8, 2014. Stockler MR, Hilpert F, Friedlander M, et al. : Patient-reported outcome results from the open-label phase III AURELIA trial evaluating bevacizumab-containing therapy for platinum-resistant ovarian cancer. J Clin Oncol 32 (13): 1309-16, 2014. Liu JF, Cannistra SA: Emerging role for bevacizumab in combination with chemotherapy for patients with platinum-resistant ovarian cancer. J Clin Oncol 32 (13): 1287-9, 2014. Burger RA, Sill MW, Monk BJ, et al. : Phase II trial of bevacizumab in persistent or recurrent epithelial ovarian cancer or primary peritoneal cancer: a Gynecologic Oncology Group Study. J Clin Oncol 25 (33): 5165-71, 2007. Cannistra SA, Matulonis UA, Penson RT, et al. : Phase II study of bevacizumab in patients with platinum-resistant ovarian cancer or peritoneal serous cancer. J Clin Oncol 25 (33): 5180-6, 2007. Vasey PA, McMahon L, Paul J, et al. : A phase II trial of capecitabine (Xeloda) in recurrent ovarian cancer. Br J Cancer 89 (10): 1843-8, 2003. Monk BJ, Han E, Josephs-Cowan CA, et al. : Salvage bevacizumab (rhuMAB VEGF)-based therapy after multiple prior cytotoxic regimens in advanced refractory epithelial ovarian cancer. Gynecol Oncol 102 (2): 140-4, 2006. Kaye SB: Bevacizumab for the treatment of epithelial ovarian cancer: will this be its finest hour? J Clin Oncol 25 (33): 5150-2, 2007. Garcia AA, Hirte H, Fleming G, et al. : Phase II clinical trial of bevacizumab and low-dose metronomic oral cyclophosphamide in recurrent ovarian cancer: a trial of the California, Chicago, and Princess Margaret Hospital phase II consortia. J Clin Oncol 26 (1): 76-82, 2008. Vergote I, Calvert H, Kania M, et al. : A randomised, double-blind, phase II study of two doses of pemetrexed in the treatment of platinum-resistant, epithelial ovarian or primary peritoneal cancer. Eur J Cancer 45 (8): 1415-23, 2009. Miller DS, Blessing JA, Krasner CN, et al. : Phase II evaluation of pemetrexed in the treatment of recurrent or persistent platinum-resistant ovarian or primary peritoneal carcinoma: a study of the Gynecologic Oncology Group. J Clin Oncol 27 (16): 2686-91, 2009. Updated statistics with estimated new cases and deaths for 2017 (cited American Cancer Society as reference 5). Added text to state that an analysis of 2,655 patients enrolled in GOG-0182, only cytoreduction to node-visible disease that is R0 (i.e., complete surgical resection) had an independent effect on survival (cited Horowitz et al. as reference 5). Added text to state that although more toxic, the weekly paclitaxel regimen did not adversely affect quality of life when compared with the intermittent schedule (cited Harano et al. as reference 25). Added text to state that two phase III studies compared the outcome of standard primary cytoreductive surgery (PCS) with that of neoadjuvant chemotherapy followed by interval cytoreductive surgery; both studies demonstrated that progression-free survival and overall survival were noninferior with PCS (cited Kehoe et al. as reference 50). Added text to state that between 2004 and 2010, a group of 87 hospitals in the United Kingdom and New Zealand enrolled 550 women with stage III or IV ovarian epithelial cancer and randomly assigned them to undergo PCS followed by six cycles of chemotherapy or to receive primary (neoadjuvant) chemotherapy for three cycles, followed by surgery and three additional cycles of chemotherapy (cited level of evidence 1iiA). Added text to state that these studies and additional observational and partially published phase III studies have led to the publication of a Clinical Practice Guideline on behalf of the Society of Gynecologic Oncology and the American Society of Clinical Oncology (cited Wright et al. as reference 51). This PDQ cancer information summary for health professionals provides comprehensive, peer-reviewed, evidence-based information about the treatment of ovarian epithelial, fallopian tube, and primary peritoneal cancer. It is intended as a resource to inform and assist clinicians who care for cancer patients. It does not provide formal guidelines or recommendations for making health care decisions.